Introduction by the journal Editors. The American Museum greatly desired to obtain one of those marvels of the bird world, a nest of the sociable weaver bird, both for the information and pleasure such an exhibit would give to the public as well as for its scientific value. Therefore, when in 1924 Doctor Friedmann was planning to go to South Africa on quite another mission, it was decided that the opportunity to procure materials for an exhibition group of the social weaver might not repeat itself for some time, and Doctor Friedmann gladly undertook to try to collect the desired material. The remarkable structure will be put on exhibition at the American Museum. Doctor Friedmann's observations, on which this article is based, were made chiefly around Maquassi, Transvaal, January 15-23, 1925, and are published in this issue of Natural History by permission of the Secretary of the Smithsonian Institution. The author writes about the interesting breeding habits of the Sociable Weaver. He writes very little about the difficult task of collecting and transporting the chosen nest mass, but this is well illustrated in a series of black and white photos. He searched a wide area in North-West Province, finding nests that ranged in size from 10 to 95 chambers. 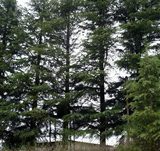 Herbert Friedmann chose a nest not too far from a railway line, on the farm of Mr. James M. Lamont near Maquassi [near Wolmaranstad]. 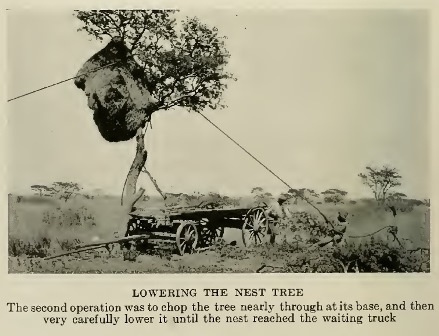 The nest was transported by cart to the railway, and would then have travelled by ship from South Africa to New York, where it was finally taken to the American Museum of Natural History.